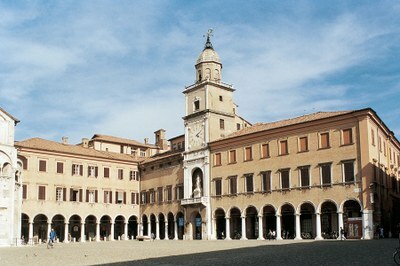 The charming arcade of the Palazzo Comunale constitutes the north-west frame of the Piazza Grande. Produced in accordance with the original 17th-century designs by Raffaele Rinaldi (known as ‘il Menia’), it was completed in 1825 with the addition of three more archways to the five already present on the right-hand side. In its current form, the building features a coherent unity due to the standardisation and consolidation of a series of single buildings built in different eras, in order to house the Commune and later, from the 17th century onwards, restructured and harmonised with a view to organising them into a single and homogeneous building complex. Currently, the rooms on the ground floor beneath the eastern arcade feature a series of bas-reliefs decorating the entrance arch to the “Loggia delle contrattazioni” (the ‘Negotiations Loggia’), by Benito Boccolari and Dante Zamboni (1938), commemorating the ancient commercial role of those spaces. The Torre dell’Orologio occupies the place where there appears to have once stood the ancient tower which served as the Arengario del Popolo (local government offices); it gained its current appearance in the 16th century. In 1508, following the designs of Bartolomeo Bonascia, the octagonal cupola on the top of the tower was erected, followed in 1520 by the balustrade that crowns the quadrangular block. The reliefs, with the four winds and the frieze above the clock face, were added around the mid-16th century by Ambrogio Tagliapietre. In 1730, a new clock produced by Ludovico Riva was installed, to be replaced in 1868 by one with two faces, designed by Ludovico Gavioli; this is the one still to be found in the Palazzo. There are also clocks in Piazza Grande and Piazzetta delle Ova (the ‘Square of the Eggs’), some forty metres away, exploiting the same mechanical design. In 1761, the marble balustrade around the balcony of the Immacolata (‘Virgin Mary’) was built by Domenico Puttini: the current statue of the Madonna was placed here in 1805 to replace another statue of the Virgin with Child and the Young St John, a terracotta work by Antonio Begarelli, which was placed in a niche next to the Tower up until the years of the French Revolution, and is today housed in Modena’s Museo Civico d’Arte. The main entrance is found in Piazza Grande: here, from the first arch along the eastern arcade, the great Renaissance access stairway starts, leading to the loggia, from which the inside of the palazzo may be reached, and where several rooms on the first floor may be visited. Through a corridor decorated with canvases by Modenese painters of the second half of the 19th century, to the right of the lift we come to the Sala della Torre Mozza (‘Room of the Cropped Tower’), so called because here the wall of an ancient civic tower may still be seen, testifying to the medieval origins of the Palazzo. In the Camerino dei Confirmati, a small room situated between the so-called Sala del Fuoco and the Sala del Vecchio Consiglio, we currently find the renowned Secchia rapita. Originally housed inside the Ghirlandina Tower. This object has no material value but supreme symbolic value, in that it is a token of the controversy between the Modenese and the Bolognese. The Bucket is said to have been stolen from a well in the centre of Bologna, and inspired Alessandro Tassoni to write the mock-heroic poem of the same name. This room was decorated in 1770 by Antonio Carbonari and Girolamo Vannulli with four chiaroscuro busts by the painters Bartolomeo Schedoni, Ercole dell’Abate, Francesco Vellani and Francesco Vaccari placed against trompe l’œil scenery. To the right of the Camerino, there lies the Sala del Fuoco, so called because in the large, majestic fireplace (a 17th-century work by Gaspare da Secchia), embers were prepared for distribution among the market sellers during the winter months. The room is decorated by a major cycle of frescoes depicting the War of Modena of 43 BC, and the rise to power of Augustus; this was done by the hand of Nicolò dell’Abate (c. 1512 – 1571), painted in 1546 as commissioned by the Conservatori (the elected city governors), who gathered here to conduct the business of the city. With our back to the fireplace, the episodes we see depicted are (from left): the siege of Modena during which Brutus orders the oxen to be slaughtered in the square so as to feed the besieged; the battle between the armies of Antonius and Octavianus; the encounter between Marcus Antonius, Lepidus and Octavianus on an island of the River Lavino which marks the second Triumvirate (anticipated so that the main wall could be reserved for it) and the encounter between Decimus Brutus and Octavianus on the banks of the Lavino. Above the fireplace, Hercules is depicted forcing open the mouth of the Nemean lion, an allusion to the Duke Hercules II d’Este. The beautiful wooden coffered ceiling was carried out by Giacomo Cavazza and painted by Lodovico Brancolino and Alberto Fontana. In the central panel we see the crest of the Commune. A frieze runs around the walls, just under the level of the ceiling, in which triglyphs and metopes alternate, decorated with motifs of ancient Roman inspiration. To the left of the Camerino del Confirmati is the Sala del Consiglio Vecchio, the ceiling of which was decorated by Bartolomeo Schedoni and Ercole dell’Abate at the start of the 17th century, with subjects concerning the exaltation of good government and patriotism. At the centre of the vault, a genie holds the world astride an eagle which, in turn, grasps well augers in its talons, an allegory of the Council and of the Ducat. The chiaroscuro scenes representing miraculous episodes of the life of the Patron Saint Geminianus were repainted by Francesco Vellani (1689 – 1768) in 1766. The painting showing the Patron kneeling as he points to the city of Modena before the Virgin of the Rosary, by Ludovico Lana (1597 – 1646), was produced as a processional standard to mark the end of the terrible plague of 1630. In the room we also find two other canvases: St Francis and the Angel by Ercole dell’Abate and St John the Baptist and an Angel by Bartolomeo Schedoni. The benches of the Conservatori in carved wood date back to the 16th century, separated by vertical pilasters and wall panels crowned by an entablature with metopes and triglyphs. They were produced for the nearby Sala del Fuoco in the mid-16th century, and moved here in the 17th century. From the Sala del Vecchio Consiglio, we may access the Sala degli Arazzi (‘Room of the Tapestries’). The walls are adorned with paintings by Girolamo Vannulli on 18th-century canvases designed to look like tapestries; there is also a work by Francesco Vaccari, framed with volutes and blossoming branches. The paintings offer an excellent imitation of the tapestries so much in fashion in France in the 18th century, and portray episodes from the Peace of Constance (1183), which brought to an end the conflict between the Communes of Northern Italy and Frederick Barbarossa. In the vault, a great medallion contains a depiction of Charity breast-feeding inside a rich perspective frame with faux stuccoes by Francesco Vaccari, while between the windows there stands the allegory of Abundance. On the floor, in wood, we see the Modena coat of arms. From the Sala del Vecchio Consiglio, a door leads into the vast Sala dei matrimoni (‘Wedding Room’): the vault was painted by Francesco Vaccari in 1767 with a wide-volute monochrome architectural motif surrounding a central oval in which the crest of Modena is depicted, held by two genies. The walls feature numerous paintings by Adeodato Malatesta, the most prominent Modenese painter of the 19th century. There are many portraits constituting a sort of ideas gallery of the Modenese painter’s contemporaries, but there are also historical subjects and works inspired by antiquity and consolidated pictorial models.